You have to be in social networks, but what role do they play in marketing strategy? This is a guest post written by Tristán Elósegui, founder and marketing consultant at Matridiana. Social networks are constantly evolving. Their role in a marketing strategy has changed over time. From the very beginning, companies have searched for ways to use social networks as one more sales channel in their marketing strategies. Given the difficulty of finding a direct path to sales, many avenues have been tried, but with sales always in mind. This is logical, companies survive on sales and not the number of followers of their social profiles. The reality is that social networks as a social platform (I'm not talking about advertising) are not a direct conversion channel such as Adwords. Even if we look at the advertising aspect, the conversion rates of both channels are not comparable. The reason is simple. The uses we give them are totally different (at least at the moment, they evolve so quickly that we nothing can be stated with certainty). We use social networks to socialize and search engines to find information, buy, etc. Social networks are just that, social. They are a communication channel between people, they are not made for company – person communication. Social networks are a great channel for recommendation, not direct conversion. Social networks are the bridge between the initial reach and the final conversion. Now this has been clarified, what use are social networks? What role do they play in the marketing strategy of a company? That they are not the perfect sales tool, does not mean they have no place in a marketing strategy. On the contrary, their applications are many and of great importance. 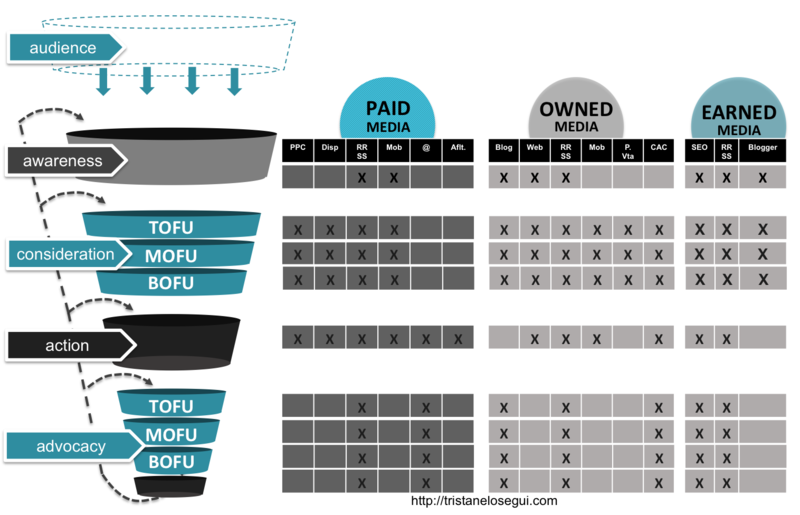 Influence throughout the phases of the purchasing process of our audience. Role in the process of defining a marketing strategy. If you want to gain a global vision beyond social networks and to learn how to implement a marketing strategy to maximize results, I invite you to a free masterclass (in Spanish) where I will show you how to achieve just that. In both areas, social networks provide us with a lot of value. If we define as a reference the purchasing decision process combined with the means available to execute the strategy (paid, owned and won media), we can see their contribution in each phase. Because of their widespread use among our audience we may think, and in fact, many companies do, that social networks serve every purpose. To publicize a product, to help our audience to get to know it, to sell it and to build customer loyalty. And while it's true that we can do all the above, it does not mean that social networks are the best alternative for each phase. For certain phases, there are better alternatives. In any case, companies must find a way to integrate themselves into the conversation of their audience to make their messages more effective. When our audience is not in "buying mode", the best time to contact them (and the most influential) is when they are looking for information to compare different purchasing options (both from within, but especially outside social networks). That is, in the consideration stage. This is when they are most receptive and are asking their contacts in social networks for recommendations about a product or service. In this way, the recommendation of the company, in the form of advertisement or content, has its greatest impact. It will generate an initial visit to the web and a number of times, a subsequent conversion through another channel (web, email, AdWords or direct). At this moment, social networks are the perfect tool to create relationships between the company and its audience. In the moments prior to and following the consideration phase, social networks are a good complement to the marketing strategy, but not the main channel. It is true that social networks are still not 100% significant for all sectors, but for a large majority they are an excellent research tool, they are a source of data to better understand our market, competition and audience. If we look at the phases in the definition of a marketing strategy, we should be clear about those points which shed light on various topics. Market: to identify trends, look for potential influencers for our brand or the suitability of each social network for our brand. Competition: we can carry out a full analysis of the competition. We can analyze their activity, compare opinions of the audience about the products/services of the sector, benchmark the most effective actions, etc. Audience: gather information about the activity and profile of our audience which we can later use in the definition of the audience profile. Definition of the audience profile: social networks provide information of the highest value. We can see not only their profile, but also their tastes, habits, companies/people of greatest influence, etc. 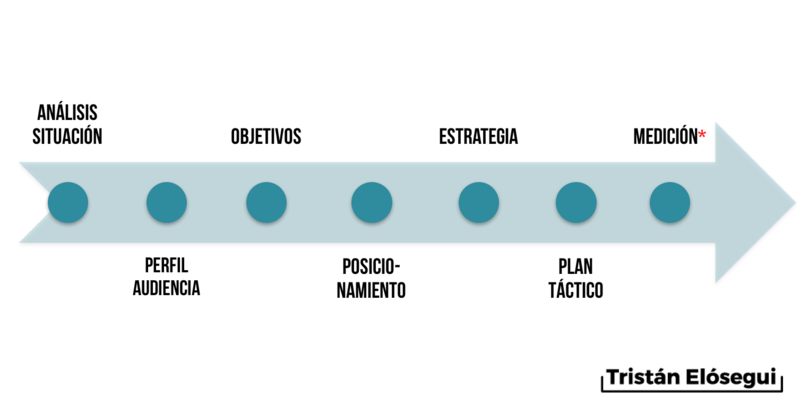 If you want to learn how to define an audience profile step by step, take a look at this article (in Spanish). Positioning: by having access to all the public data, we can define the brand attributes of the competition and use them to try to differentiate ourselves with more powerful positioning. 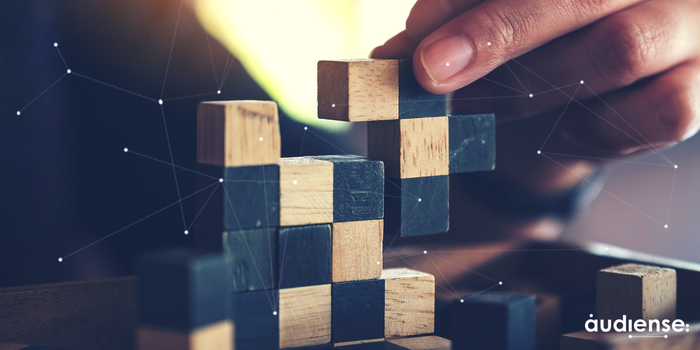 Strategy: as we have already said, we can define what the role will be within social networks, what goals we want to achieve in each phase of the purchase funnel and what their main role is. My recommendation is that we use them to create relationships with our audience in the consideration phase and they provide support work in the other phases. Measurement: as well as allowing us to measure each action carried out, as a channel of communication that is close to the market, they are an excellent complementary indicator for strategic dashboards.